are probably pretty familiar with the many features Toolbar 5 (beta) has to offer — from bookmarks to buttons and search box to "send to." We've added a couple more features to the Firefox Toolbar, so feel free to download this "second beta" to get all the latest and greatest Google Toolbar has to offer. One of the features I'm really excited about is the new tab page. Now, when you open up a new tab, instead of the blank white page you see by default in Firefox, you will instead see small thumbnails of your favorite sites (up to 9), as well as recently-closed and bookmarked pages based on your browser history. You can edit the thumbnails, and all this data remains locally on your browser, which means none of the information about your most viewed sites or recently closed pages will be sent back to Google. If for whatever reason you don't like this updated new tab page, you can always change it back to a blank page or to the website of your choice through either your Toolbar or Firefox settings. Some tab extensions may conflict with this feature, and it currently isn't compatible with Firefox 2, so make sure you check your settings or visit the Google Toolbar help center if you are having any problems. Next time you want to go to your favorite site more quickly or restore an accidentally closed tab, you don't need to type out the URL. Typing Ctrl + T or double-clicking to the right of your open tabs will open up the new tab page with all your favorite sites right at your finger tips. In addition, this release now provides the ability for Hebrew- and Arabic-speaking users to access Toolbar 5 with robust right-to-left text support. We've also fixed some of the most reported bugs to give you a faster and more stable experience with this update. We're always working on improvements and new features to Google Toolbar based on your feedback, so keep those suggestions coming. Update on 4/1: Yesterday, Firefox Toolbar 5 came out of beta. 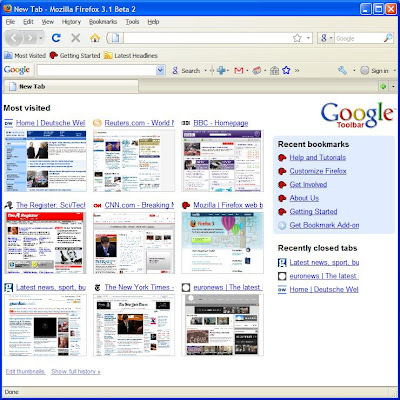 Those of you who use Google Toolbar on Firefox are probably pretty familiar with the many features Toolbar 5 (beta) has to offer — from bookmarks to buttons and search box to "send to." We've added a couple more features to the Firefox Toolbar, so feel free to download this "second beta" to get all the latest and greatest Google Toolbar has to offer.